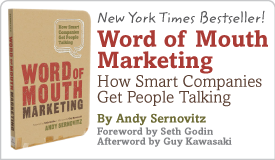 How to WOW your fans when things go wrong | Andy Sernovitz | Damn, I Wish I'd Thought of That! The opening act cancelled before the show. I had never heard of them – and actually had no idea that there was an opening act. But I got an email with a $5 refund on each ticket to apologize for the change. Folks, this is how you impress your customers and create fans for life. Do the right thing, before people ask (even if it costs you a little money).